These are the best nappy pants I have tried. Super absorbent and a very soft inside. They can last overnight without and leaks. They are great for a wiggly Bub that doesn’t want to stay still to be changed. They have super stretchy sides that are easy to get on without ripping. Only nappy brand I buy, well absorbent and eay to use! The stylish and cute patterns are awesome. Also the bulk size boxes make a great buy! This is an amazing step up from the normal old nappy. Huggies have done themselves proud with this product. I shall be continuing to buy. 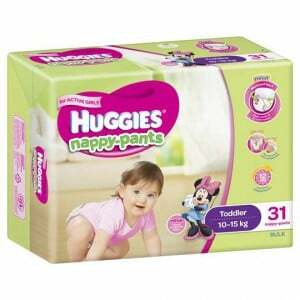 How would you rate Huggies Nappy-pants Toddler Girl 10-15kg Bulk?